Even in good times, buying or selling an estate in Scotland is a stately process that can take months, or even years, to complete. So, at a time when the demand for Scottish country houses remains as subdued as the supply, land agents north of the border have been pleasantly surprised at the recent surge of interest in Highland and sporting estates. And not just from the usual suspects, but from wealthy buyers based in Hong Kong, Malaysia and Singapore, who normally wouldn’t consider anything north of Hampstead. But this isn’t simply a question of canny investors picking up large swathes of rural Scotland at bargain-basement prices in a depressed market. After only two months of marketing, Jon Lambert of John Clegg & Co in Edinburgh (0131-229 8800) has already announced a closing date of August 16 for receipt of final bids for the picturesque, 5,240-acre Glenstriven estate on Argyll’s unspoilt Cowal Peninsula, currently for sale at a guide price of ‘offers over £6.47 million’ for the whole, or in eight lots. The estate lies on the west side of the peninsula, a gloriously wild area of lochs, glens, sea, mountains and forests, yet within an hour’s drive of Glasgow airport. Bought by its present owner in 1991, Glenstriven has been improved and developed in many ways in the past 30 years, notably by the creation of a world-class pheasant and partridge shoot, reckoned to be one of the best in Scotland. At its heart sits Glenstriven House, a substantial, eight-bedroom country house built in 1840. Offers over £2.5 million are sought for the house, with its converted former stable block, outbuildings, estate pier with access to the sailing waters of the west coast, and 1,849 acres of land and commercial forestry rising from the edge of Loch Striven to 600ft or more above sea level. Other lots include half a dozen delightful small houses and farmhouses scattered around the lochside, at offers ranging from £265,000 to £375,000, and Inverchaolain Glen, a 3,365-acre estate in its own right with a farmhouse, keeper’s house, partridge shoot and stalking, for which offers over £2 million are invited. The sale of the 4,579-acre Glencripesdale estate on Argyll’s magical Morvern peninsula, at offers over £2.6 million through Bell Ingram (01631 566122) and John Clegg & Co (0131-229 8800), provides ‘a unique opportunity to create a sustainable Highland forestry and sporting estate in one of the least explored areas of Scotland’, the agents say. Once part of the medieval kingdom of the MacDonalds, Lords of the Isles, Glencripesdale was seized by the Crown in 1493, and held from 1674 by the Campbells of Argyll, before the profligate 6th Duke of Argyll was forced to sell the whole of his Morvern property in 1819. In 1871, the estate was bought by the Newton brothers from Birming-ham, whose father, a wealthy industrialist, had left them ‘an absurdly large fortune’. In 1873, the Newtons began construction of a three-storey, 20-bedroom mansion. From its heyday in the late 1800s until 1944, when the house and estate were requisitioned by the army and badly vandalised, Glen-cripesdale was a thriving farming, sporting and woodland estate with a diverse range of activities. In 1948, it was sold by the Newtons, and was later bought by the Forestry Commission, which called in the army to blow up the derelict mansion, and planted the estate as a commercial forestry plantation. 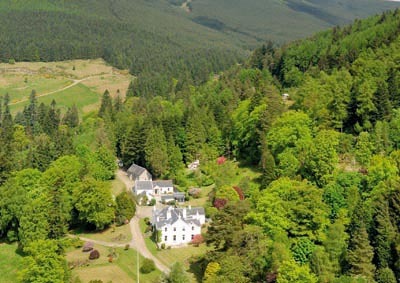 The present owners, who bought Glencripesdale in 2002, have already implemented the initial stages of a masterplan drawn up by their predecessor to restore and improve the estate as a viable working entity, with areas of established forestry providing a sustainable stream of income for the next 30 years. Planning consent has also been granted for the construction of a substantial estate lodge and a caretaker’s house. As a firm, CKD Galbraith (01463 224343) manages more than a million acres of sporting estates across Scotland, where shooting, fishing and stalking generate an estimated £275 million of annual income for the rural economy. But a Scottish estate is only for those who can afford the annual running costs, which can be substantial, warns John Bound, head of the firm’s estates division in the Highlands. He recently took on the sale of two of the most outstanding estates in beautiful Wester Ross, Heights of Kinlochewe and Tournaig, at guide prices of £2.6 million and £2.5 million respectively. Kinlochewe has already found a buyer, leaving the 6,697-acre Tournaig estate at Poolewe still on the market-but surely not for long. Tournaig is a well-rounded and carefully managed Highland sporting estate. Its focal point is Tournaig House, a substantial stone house built in its present form in the 1920s, and surrounded by wonderful woodland gardens designed by Osgood Mackenzie, who established the gardens at nearby Inverewe, now owned by the National Trust of Scotland. The seven-bedroom main house stands in an idyllic setting with coastal frontage, a pier and a potential mooring on Loch Tournaig, and comes with four estate cottages and various farm buildings. The estate includes an in-hand stock farm, and offers red-deer stalking, as well as excellent trout fishing in a number of hill lochs. Anna Thomas of Savills in Edinburgh (0131-247 3720) has fielded more enquiries from prospective American purchasers in recent weeks than in the whole of the past 10 years. But it’s not just Highland estates that are hogging the limelight. Buyers are showing plenty of interest in the historic, 2,264-acre Hensol lowland farming estate at Mossdale, near Castle Douglas, in Dumfries and Galloway. Offers over £4.25 million are invited for the estate as a whole, or in three lots, with a guide of ‘excess £1.9 million’ quoted for the category A-listed, Tudor Gothic, Hensol mansion house with five reception rooms, 10 bedrooms and 770 acres of gardens, grounds and productive farmland. In all, the estate has four separate farm steadings, including permanent pasture, rough grazing and commercial woodland, an established driven pheasant shoot, roe-deer stalking and 5½ miles of frontage to the River Dee.